Enjoy a pre-Valentine evening of romance in song at La Cueva Panza Verde, where lyric tenor Brian OliverSmith will perform some of the greatest arias and love songs ever composed. The tenor in opera is always the romantic. Sometimes he’s a starry-eyed lover, or a fool in love, or crazy with jealousy and rage, but whatever his mood he always brings the passion—and the high notes. Brian, originally from Chicago, has performed with the Los Angeles Opera and shared the stage with Placido Domingo and others. He will be singing works by composers including Mozart, Puccini, Donizetti and Lehar, from operas such as Tosca, Don Giovanni, Elixer d’Amore, Pagliacci and more. 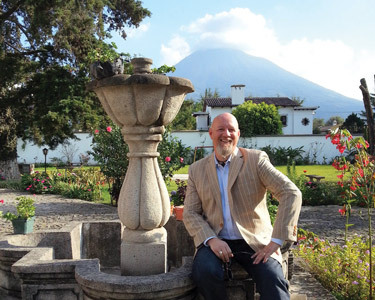 He is accompanied by Maestro Herber Morales, professor of music at Universidad de San Carlos de Guatemala who has worked as a repetiteurs for soloists and chorus master in many opera productions. Herber has also performed as pianist at many lyric concerts and recitals for international artists, including Andrea Bocelli. He was glad to be the official pianist for the late baritone Dr. Luis Giron May. So grab your favorite romantic and enjoy an “Evening of Passion—with No Regrets in the Morning” starting at 5 p.m. Feb. 6 at La Cueva de Panza Verde, 5a av. sur #19, La Antigua Guatemala. Donations requested.